Back in May. 2015 I wrote my first blog about telephone counseling. Over the last few months, I concentrated on becoming a Distance Certified Counselor. Many states are recognizing the benefits of working in creative ways to reach clients, who because of geography, chronic disease or disability are unable to receive counseling in the typical face to face method. My new credential looks like this: Distance Certified Counselor, or DCC. Distance Counseling is nothing new. Sigmund Freud often corresponded with his patients by letter in between regularly scheduled appointments. Its popularity has increased over the last 20 years as the therapeutic world embraced the digital world. I participate in distance counseling in order to reach a wider range of people in various locations and to reach people who are unable to participate in typical face to face sessions. Distance Counseling is an approach that takes the best practices of traditional counseling as well as some of its own unique advantages and adapts them for delivery to clients using electronic means. I prefer using telephone, teleconferencing, and texting when working with my clients. We now know some clients prefer the anonymity of a distance counseling relationship and are more likely to open up and self-disclose than they would be in a traditional counseling setting. For those individuals who are ambivalent about therapy or who may be uncomfortable with traditional models of therapy, Distance Counseling may be your answer. This is particularly true for individuals who are suffering social phobia, agoraphobia or anxiety disorders. If Distance Counseling if intriguing to you, please be give me a call. This writing was shared with me by one of my clients. With her permission, I am sharing it with you. Enjoy!!! I watched the Everest Imax movie in high school. Climbers buy the best quality gear to help them in their quest to the top. They search out the warmest, lightest outwear to protect themselves from the elements. They hire the most experienced, capable guides to lead them. Yet still, they need to climb. They need to put one foot in front of the other. They need to trudge through snow, and balance themselves on ice covered cliffs. True, without the gear, the protection, and the guides you wouldn’t last thirty seconds moving towards your goal. But all the money in the world, the best guide and the latest model gear cannot get you up to the peak of the mountain if YOU are not willing to climb. This is how I sometimes feel about battling my anxiety. I have the best therapist, an awesome doctor, a sensitive husband, a supportive and understanding family, and the sweet love of my children. I have researched and found medicine that works for me, increasing my serotonin to normal levels. I do stretching and breathing exercises, and occasionally get a massage. But I still need to be the one to climb the mountain. I need to put one foot in front of the other when I feel like I’m about to throw up from the intense anxiety pushing at my chest. I need to trudge through my thoughts and feelings to figure out if there is, and if so, what might be the source of why I feel this way. I need to carefully balance my priorities so I don’t waste precious mental energy and time. It’s so different from my experience with a physical illness. But really, it’s more like a very long international flight that gets delayed about half the day so you almost miss your connection. You wait for hours in a stuffy, dirty, overcrowded waiting area. You sit in a narrow seat on the plane flanked on either side by people who could either use a shower or are wearing a nasty smelling deodorant. And sometimes you even have to run through an airport to catch a flight. It’s not a pleasant experience, but you are not the one physically doing the work. There are pilots flying the plane, and flight attendants who actually offer you a drink. It took time to find the right doctor, and alternative care, but really in the end all I had to do was show up for appointments and make it through the prep for surgery without vomiting, (ok so I did vomit, but who cares?). And people understand physical pain. They get it. They are sympathetic. And somehow, that helps. But even if everyone in the whole world understood emotional pain, if I didn’t put one foot in front of the other, there is no way to get any closer. I was diagnosed with MS in 1982, the Dark Ages. I remember my husband and I sitting across the desk from my neurologist. He told us it was probable that I had Multiple Sclerosis. We went home, tried to absorb and add this uninvited guest to our family. I went back to work. I realized I might not be able to keep up with the demands of my work. I needed more control over my time. I needed more flexibility. Going back to school to get a Ph.D. was on my bucket list. It was never on my radar that MS would stop me from doing anything! Maybe a Pollyanna or maybe I believed my determination would get me through. Fortunately, whatever fueled me worked and I finished my degree. By now I was a few years into MS Land and I had begun to understand how MS played in my body. I developed some rules for myself. The first was a three-day rule. If a new symptom showed up, I would watch it for three days. If it didn’t go away, I would call the doctor. Of course that usually led to rounds of steroids which worked but made me crazy! My second rule was: If you play, you will pay. That meant if I pushed too hard because there was something I really wanted to do, I would have to set aside time to rest. Sometimes it was just worth it! My final rule: Sneakers are a fashion statement! I went into private practice as a psychotherapist. My clients were people living with MS and other chronic illnesses. There were mornings I wished I could stay in bed. I went to work anyway. Once I was with a client I felt so much better. My clients were my medicine! I treat my MS with respect and as a puzzle I have to solve. I have every piece of durable equipment I might need. I use a cane when I go to unfamiliar places. I use a walker when I’m falling too frequently. I use a wheel chair when I travel to New York. I was developing resilience every time I solved a problem created by my MS I was becoming more resilient. 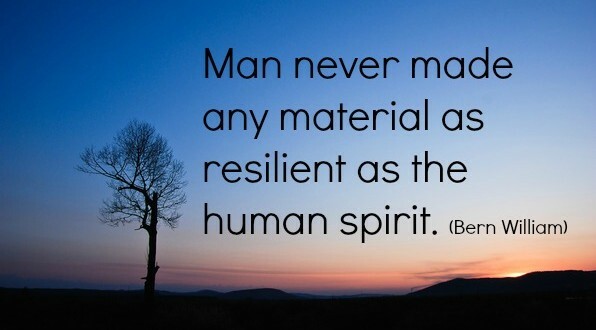 The word resilient comes from the Latin meaning to rebound or spring back. I often think of MS like a rubber band. When symptoms flare up, I am stretched out of shape and sometimes I think I might snap. Then the symptoms dissipate and the rubber band springs back, but never exactly to its original shape. There’s a new normal. I wondered if people were hard-wired to bounce back or if one could learn to be more resilient. Both, according to researchers, whose work suggests that we are born with a self-righting ability which can be helped or hindered. For me, I found the most important thing to keep in mind is to be realistic and positive. When I lose that attitude because of all the other stressors that come with being human, I try not to stay there for long. Be thankful, especially for the little things. Try something that you thought you couldn’t do anymore. After years of dancing in my head, I decided to try dancing lessons and in spite of terrible balance, dancing came back into my life. Leverage your strengths, whatever they are. I am a social being so I work at not isolating myself. I feel the best when I am with other people. I try to turneverything into a social event, even exercising. I also like to write poetry; it keeps my mind working. Think about what you’re good at and use it. Set good boundaries. Only you know what’s best for you. Learn to say no without feeling guilty. The people who are important to you will understand.